German researchers with state backing have developed a light fabric horse blanket to provide protection against biting insects. The new German-developed horse cover which protects against biting insects. 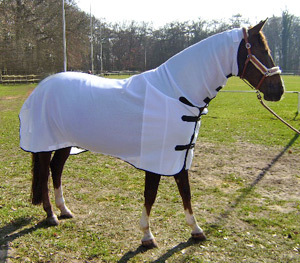 The blanket is also designed to deliver natural repellents, providing two-way protection for horses. Research at the Institute for Hygiene and Biotechnology at the Hohenstein Institutes, in Bönnigheim, was carried out under the direction of Dr Timo Hammer in conjunction with HKM Sports Equipment GmbH, in Neuenhaus. Hammer said there were two options for protecting animals and humans from insect bites - applying repellents and providing mechanical protection through a barrier such as a textile. The aim of the project was to develop a blanket that would combine both principles, mechanical and chemical. The textile needs to be as resistant as possible to puncturing by as many different types of insects, from tiny mosquitoes to large horseflies. To test this, the Hohenstein researchers have specifically developed a test system to check the resistance of textiles to puncturing by insects. In this test, the biting and piercing apparatus of central European pests are simulated. As well as providing a mechanical protective effect, the blanket should be comfortable for the horse to wear and the repellent needs to be skin-friendly. Another requirement of the textile is that the animals do not sweat under it and that no toxicological substances are absorbed through licking the insect protection blanket. The result of the research project is a blanket which protects the horse using an extremely light spacer fabric and optimised fit and which is also pleasant to wear. The light material used for the blanket means that the animals don't suffer any build up of heat, even in the height of summer. The textile also has good moisture vapour transmission, which means that sweat evaporating from the animal causes no problem. The protective blanket can be equipped with replaceable delivery systems for the active repellent substances. This means that the animal is protected against insects by natural active substances for several weeks. The blanket is also wash-resistant and weatherproof, making it suitable for long-term use. "The innovative horse protection blanket is a successful example of the rapid development of a good idea into a marketable product," said Hammer. The new blanket will go on the market in the northern summer of 2012. The project was funded by the Federal Ministry of Economics and Technology, based on a decision by the German parliament.